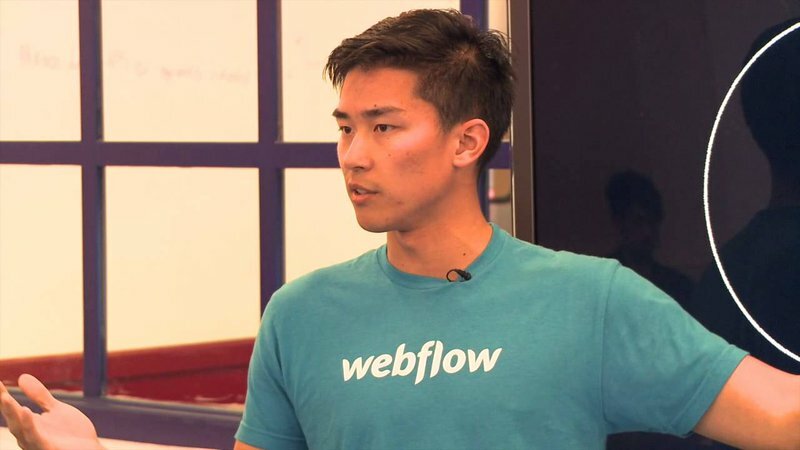 For this eighteenth episode, I talked to Bryant Chou of Webflow, one of the leading website building platforms in the world. After working at Intuit, the company behind Quickbooks and other software, and then launching his own startup in mobile advertising, Bryant co-founded Webflow to bring responsive design capabilities to website builders. We talk about Webflow’s infinitely large roadmap, how it’s like to combine being a first-time parent with having a growth company, the Regret Minimization Framework and the importance of faster product-market fit. Jeroen: Hi, Bryant. Great to have you on Founder Coffee. Bryant: Hey, Jeroen. Nice to meet you. It’s awesome to be here. Jeroen: You’re the founder of Webflow. For those who don’t know Webflow yet, what does your company exactly do? Bryant: Yeah. So Webflow is a web design and web publishing platform. So we have a tool that is unlike the WYSIWYG builders like Dreamweaver, Wix and Weebly. We have a tool that essentially abstracts away the complexity of code – specifically HTML and CSS. So this is a product that, before Webflow, didn’t really exist. A lot of products like Dreamweaver made it really easy for people to draw circles and squares, and then magically, it would turn it into HTML and CSS. But in the age of responsive design, mobile apps and mobile websites, that approach eventually broke down. So we really started writing the back of the responsive web design movement back in early 2010, early 2012. And we built the tool as a responsive-first web design tool. And from there, we evolved our tool. We evolved past static web pages, like landing pages. We added a CMS. It’s the world’s first visual CMS. And now essentially the platform is the culmination of a lot of the initial ideas that we had around Webflow, which is to empower anyone to build software visually. So we’re focusing on the web for now, but really, Webflow in its current iteration is essentially a modern-day WordPress mixed with Photoshop. It has the web design flexibility of a powerful tool like Photoshop, combined with the web platform and web publishing capabilities of WordPress. Jeroen: So what are the some of the craziest things that you can build in Webflow? Bryant: Oh, man. So we had a YC founder create a database of all the YC companies. I think there are over 1,500 companies. And it had all of these custom fields. It showed the founders. It was essentially this massive directory. We also had this T-shirt company run their entire eCommerce store on top of Webflow, and this T-shirt company had over 30,000 products, and they’re generating over $30 million in revenue a year. So people are building really crazy powerful things, and people are also building really basic things too, just portfolios and basic business websites. So we’re also coming out with Webflow eCommerce next week. So in the middle of November, it’s really going to be the first eCommerce platform that comes out that is of the modern age. Our eCommerce platform will give you the ability to build bespoke eCommerce websites completely visually, so you don’t need to hire a developer to go in and modify your Shopify templates. You can go in and build completely customizable checkout flows. We’re talking about the same sort of functionality that a Magento site may have that costs $50,000-100,000 to build, but you can build it in a span of a few days or a week in Webflow. Jeroen: So it’s kind of like a Squarespace for personal websites or an Unbounce for landing pages, but much more advanced, because you can put databases behind it, et cetera. Bryant: Exactly. It’s not necessarily the audience of a mom and pop or the typical marketer that doesn’t really know the foundations of code. So the main cohorts of customers that use us are startups. I think a very large proportion of YC companies use Webflow for their marketing sites, all the way to agencies and freelancers. So those are the ones that we actually see a lot of success with. Jeroen: Got it. Cool. Well, how is it that you got to the idea of building Webflow? When was the exact spark? Where were you then? Bryant: Yeah. So Vlad, who’s the CEO and my co-founder, actually had Webflow as his senior thesis project back in college. So it was an idea that was in the back of his head for a really long time, and for me, I’ve been a product builder for the past 10 years, and I mainly specialized in backend technology. And the front end, like coding HTML and CSS. I felt like it was the worst part of my job or the worst part of building a product. I just thought it was incredibly obtuse. I thought the technologies of writing CSS and HTML are just unnecessarily complicated. And I thought that coming from mobile development, if you use the Android builder or if you use interface builder, Xcode, for Apple, you’re accustomed to really powerful GUI software that makes building UIs a lot more straightforward. But none of that existed on the web. So the company was founded on the premise that there is still this two-step process in web development. You design it, and then your designers throw it over the wall, and then you better hope that your developers are implementing it to spec. And there’s all this back and forth. So what we really wanted to do is we wanted to empower the key stakeholders of the product design process – which are the product designers and the web designers, to be able to take it all the way. So that they can design, build, and launch their entire store all with Webflow, and they have control of it from beginning to end. Jeroen: So you’ve always hated building CSS. But now that you’re building Webflow, are you not the last one who’s dealing with the CSS? Is it not you still doing all the CSS code? Bryant: So it’s funny because we actually used Webflow to build Webflow, because all of the code that we’re creating, all the code that anyone creates in a Webflow project is, in my opinion, and a lot of other people’s opinion, production quality. Just to give you an example, for those that are more technically savvy out there, we just launched the CSS Grid in Webflow. So CSS Grid is a layout technology that exists in 99.9% of browsers, but it’s being used by less than 1% of websites. And it’s because it’s a very complicated CSS spec that requires deep technical know-how of how to write it and to make it responsive and to have it work in a really good fashion. What Webflow does is, because we have this abstraction layer over CSS, it makes it really, really easy to write production-quality UIs, and to have production-quality code come out of it. So, yes, even though we are writing code underneath to build Webflow itself because it’s a browser tool, we’re actually more and more using Webflow to create production UIs that are used in Webflow. Jeroen: Cool. Have you always known you wanted to do something like you’re doing right now? Bryant: No, I did not. When I was in high school, I really didn’t know what to study as I entered university. I essentially just happened on computer engineering because I liked to play computer games. And I was like, all right, well, if I like computer games, I better know how to build a computer game. So maybe I could get better at Counter-Strike or whatever. But then after finishing my degree, I didn’t necessarily feel like I was an engineer. I was feeling like the super technical aspects of being a computer engineer weren’t necessarily appealing to me. And I had a lot of jobs that were just not really a good fit. For example, I worked on storage area networks. I worked on large file systems. I worked on embedded systems. And I worked on super low-level things, and what I realized was that in order to use my degree and have fun at it, I would need to move up the stack. So that’s when I joined a company called Intuit here in the US, and they’re known for QuickBooks, Mint, TurboTax. And that’s really where I learned how amazing it is to build software products with the customer mindset, and I essentially happened on the fact that I really love building for customers. UIs, products that solve problems. And essentially, that’s what got my itch into startups. I left Intuit and started my first startup, which was Bungle, which is a mobile advertising company. And then what I realized was that I didn’t necessarily fit in the traditional corporate software development job. I always liked hacking on my own speed, on my own projects and falling into a typical process where I was working on something that I wasn’t super passionate about, it was just very difficult for me to do. That’s how I became an entrepreneur, and that’s how I started the companies that I have started. Just because I’ve always enjoyed hacking on things that really tickled my fancy. Jeroen: Do you feel like you can still do this nowadays, or is your job different now? Bryant: Yeah, my job is totally different now. So it’s funny because I obviously was a CTO of both of my startups. Then with Webflow, I essentially was an individual contributor for the first couple of years, and then as our team grew and grew, became more a technical leader. But around two years ago, I actually transitioned half of my time to growth marketing. We didn’t have a growth or marketing function in the company at the time, and it was just something that I felt like getting into. Somebody needed to look at growth and marketing. So I approached growth and marketing just as building a new product, essentially. I did read books, I did try and get a really good understanding of how other companies grew. But something that I really did which might be a little bit different nowadays was I really took a really fresh perspective from the marketing standpoint, which I think came from my technical background. I tried to build marketing just like I would build a product. Now I actually focus most of my time on growth and marketing. So we have a team of brand designers that I manage. We have a team of marketers that I manage. But I still try and stay involved with the backend stuff that I worked on originally at Webflow. Jeroen: When you say building marketing, what do you mean exactly? Bryant: Yeah. So here’s the thing with Webflow. A lot of people look at Webflow and they’re like, oh, it’s just another Squarespace. Oh, it’s just another WordPress, or oh, it’s just another eCommerce platform. And getting that we’re a very unique product in a very, very crowded space – I know it sounds almost like an oxymoron, what I set out to do is I tried to do everything without the regard of the status quo. Let’s take our market site, for example. If you go to Webflow.com today, it’s not going to look like your typical SaaS tool marketing site. We really wanted to do two things. We really wanted to first give you a really solid idea of what the product does. And we also wanted to showcase what’s possible in Webflow. So we have the Made in Webflow badge turned on, on our homepage, because it was really all completely built in Webflow. So when someone’s scrolling through this page, they’re like, “oh, wow”. Not only are they getting what Webflow does, but they’re also experiencing the insane amount of power that Webflow gives you. I approached this project, the marketing site, almost as building a new product. I really tried to understand the customer, I really tried to understand the technical bits of what’s available so that we can build this product, build this marketing site, and then we really tried to measure and test it. So we tried to put it in front of a lot of customers, get their feedback on it, and that’s just one example of a marketing project that I was involved in that essentially resembled a product launch. And I think that’s something that also has carried over to the culture of the marketing team, where now the marketing team is approaching a lot of different marketing initiatives almost from a product point of view. I think it’s very specific to how Webflow is structured. The DNA of the company is very, very product focused. So I’m not sure if this is applicable to other companies, but I just thought that it was just suited for our marketing team to mirror the product excellence that we had. So we wanted to take a very product-oriented approach to a lot of the different marketing initiatives that we have. Jeroen: When you say you’re a product company, I suppose that most of the customer acquisition is self-guided? Bryant: Yeah. So we have no sales. All of our customers are self-serve. Even our biggest customers, like Dell. Dell has 55 of their UX/UI web designers using Webflow, and the reason why they grew from zero or one to 55 is because one designer found out about Webflow, tried it for a specific project, and they were like, well, we have this massive initiative next year to rebuild Dell.com, and I think Webflow would be the best tool. So what they did was they essentially had this entire RFP process where they contracted out different people to test different tools. But what they ended up doing for Webflow was they just signed up for a free account, and given that we’re a freemium product and you can essentially use 95% of the features all for free, they were able to discover that they can essentially use Webflow to rebuild Dell.com. That’s kind of the story of Webflow and our growth. It is that we lead with our product. We make sure that it has everything that we think Webflow should have. We make sure that we’re solving for a very unique customer persona. That customer persona, for us, is a freelance web designer. And that freelance web designer is the lowest common denominator. That person needs everything. That person needs hosting, that person needs design flexibility, that person needs symbols, interactions, multiple pages. They need a CMS. : So that’s how we approached our product roadmap. And as a byproduct, we ended up building a product that is used by enterprises and small businesses, as well as freelancers. Jeroen: How long do you see yourself working on Webflow, as of today? Bryant: That’s a tough question, but I honestly am approaching Webflow as the last company that I ever start. I truly believe that the mission that we have, which is to empower anyone to build software visually, is a mission that has all the right ingredients. A, it has the technical challenge of being able to empower people to build software visually. That’s just a problem that people have been trying to solve for 45 years. B, it also has a large economic impact. If we think about the statistics, I think less than half of 1%, so less than 0.5% of people in the world know how to write software, write code. If we can move that percentage from 0.5% to 1% through digital development with tools like Webflow, just think of the potential economic impact that could make. Think of the number of entrepreneurs that are created now, think of the number of companies that can be created now. And that’s the road that we’re setting out on. And we’re seeing really early signs that people are essentially building huge businesses using Webflow, or at least validating their business on top of Webflow, and then potentially augmenting their Webflow site or recreating it in Heroku or whatever. So I really think that because of those two reasons, I really have no other reason to start another company. I believe the culture that we built. The level of the intellectual calibre that we have on the team, I believe the challenge that’s ahead of us, the markets that we have yet to really tap into, like eCommerce, I think those verticals are just so big. Webflow as a platform is just getting started, and we’re just starting to put in some of the big verticals like CMS on top of it. eCommerce and CMS are huge, huge verticals. Shopify is $16 billion. Webflow definitely has the opportunity to take a big portion of that, or at least help grow the overall eCommerce landscape. So there’s a lot of challenges. There’s a lot of different things that I still want to do with the company, with the product, and I don’t know. At least for the next three or four years, I’m going to be pretty busy, I think. Jeroen: Yeah. So I hear that basically for you, it’s all about growing Webflow to its full potential as a product. Bryant: Yeah, yeah. Absolutely. I joke with my team that Webflow literally has an infinitely large roadmap. The way I describe it to people is, there’s this slope of potential use cases that can be solved by software, and there’s another slope right below of what existing software is capable of, and then there’s a slope right below that of what visual development is capable of. Literally, I see Webflow as an infinite product roadmap kind of company. We can keep building stuff. We don’t have to stop at the web. We can go into mobile. After mobile, what can we do? We can go into apps. We can go into the massive CMS market. Markets that are dominated by Sitecore on the enterprise side to WordPress in the mid-market side. So, yeah. There’s just so many different ways for us to grow, which is the really exciting thing about Webflow, where it’s at today. Jeroen: Are you guys bootstrapped or VC-funded? I didn’t look it up. I suppose VC-funded? Bryant: So we raised a seed round. We raised 2.8 after YC in 2013, and we’ve been growing with revenue ever since. So we haven’t raised an institutional round or anything like that. Jeroen: Were your VCs fine with that? Bryant: Well, they were seed investors, and I’m pretty sure all of them are very happy with their investments. Jeroen: Yeah, sounds good. What other companies or founders would you personally look up to? Bryant: There are the traditional Bezoses of the world, reading their annual shareholder report. I think for me, the one guy that I have been watching, just because it’s hyper-relevant to the work I’m doing right now, is Patrick Campbell from Price Intelligently. That guy is just a beast. The kind of content that he produces, all the conferences, he just looks like he’s the Energizer Bunny of SaaS entrepreneurs. It’s pretty incredible. But the thing is that his content is a really good basis for a lot of different internal discussions that teams can have around pricing and how to think about packaging. So, yeah. Huge credit to him for helping to shape a lot of the thoughts around Webflow packaging and pricing. Jeroen: Cool. Yeah, Patrick was on the show earlier. It was episode nine, it was also a really, really nice episode. Jeroen: Actually, you talked about some of the things the company is trying to do and where it’s trying to go. What is it exactly that you do? How does your day look like at the moment? A workday, obviously. Bryant: My day probably looks quite similar to any other founder that’s involved in a company that’s at an inflexion point. So Webflow’s at 80 employees. Two years ago, it was at 35. So our operations are huge. How we want to grow the company is a really, really big focus of ours right now. So the founders are really focused on thinking about growth, but not in terms of how to increase top of the line, but the growth of the company. And the reason why we’re focused on that aspect is that if we don’t take the right steps now while we’re at 80, then we’re really going to suffer once we’re at 100, 120, 150. So that’s the mindset that the founders have right now, which is how we transition away from day-to-day decision makers and YCs to founders that are managing managers. Founders that are managing a mission, founders that are instilling values, founders that are setting a good example for operational excellence. Those are the things that were top of mind. So at least from a day-to-day perspective, I’m reviewing a lot of different material that the team has written up about the strategic direction of where we’re going. I’m reviewing goals, I’m checking in with people on goals. And then recruiting. We’re always looking to bring in new executive talents across product, engineering, marketing, operations, HR. So those are the big things at the moment. Jeroen: Which of these things give you the most energy? Because you said before that you really like the hacking around, hacking things together. But what are the things that you do now that you most enjoy? Bryant: I still enjoy that to a certain degree, but my engineers don’t really like it when I code anymore. So what I do instead is I write a lot of GitHub issues about things that I think we should hack on. I spend time talking to product managers and engineers about why they’re important. I spend a lot of time on the prioritization of a product roadmap and the allocation of engineers, and trying to think about, okay, is this the most important thing that we’re working on and why. So that we can clearly articulate it from a go to market and marketing perspective. So, yeah. I might not be hacking, and I’m probably going to hate myself for not writing code for this stretch of time. But I’m hacking on something else, I’d say. I’m hacking on building a long-term, sustainable company that is most capable of achieving its mission. So I think that’s another version of hacking that might not be discussed as much. Jeroen: I understand. How long are your working days, more or less? Bryant: With a six-month-old baby, which you might have heard in the background on this call, it’s definitely a mixed bag. I think Webflow definitely has the flexibility, the affordance for me to be flexible. So just like this morning, I had a pretty rough night with the baby. So taking this call from home. And then maybe I’ll go into the office later, or maybe not. So I guess we’re pretty fortunate in that we are cash flow positive, and we default alive, so to speak. It doesn’t mean that we’re not working as hard, but it gives us the ability to work smarter. Jeroen: Yeah. How are you managing all that with the baby? Bryant: Yeah. Day-to-day, it’s been amazing. I have an incredible wife that’s super supportive. So what I try to do is I’ll try to see the baby at least twice in the day. And so I’ll wake up early, play with her in the morning. Then I’ll try to be home by 6:00, so that I can give her a bath, and then put her to sleep. So I’m not around for the bulk of the day. But that’s hopefully what the weekend will be about, and hopefully, something that is okay long-term. But being a first-time parent is amazing, so I think I’m just incredibly fortunate to have Webflow at a place where it is, where I can rely on the strength of my team to be able to run things day-to-day. That’s huge, and being in a situation where we have growth that’s supported by customers as opposed to VCs, is also amazing. I think if we had a boss on our board that’s telling us what to do and when to do it, it changes the dynamics of your day-to-day life a little bit, at least from the mental psyche perspective. It would also probably impact our day-to-day quite a bit. Jeroen: Yeah, definitely. Makes a lot of difference. So outside work, what is it that you like to spend your time on when you’re not working? Apart from the baby, of course. Bryant: Well, I’m kind of addicted to tennis at the moment. So I try to play tennis. I’ll probably play once, twice a week if I’m lucky. And, yeah, it’s a really good release, and it’s also really good exercise. So, yeah, I think it’s a healthy habit or a healthy hobby. Or so I tell myself. Jeroen: Yeah, it is. Where are you actually based? Bryant: I’m based in San Francisco, California. Jeroen: Oh, cool. Which side of the valley are you? Or is it really San Francisco? Bryant: Yeah, I’m literally right in the middle of the city, right in Nob Hill. Jeroen: Oh, okay. Which other startups are close to your office? Bryant: So our offices are in SoMa, and pretty much every startup is close to our office. I think YC released a list of the top 100 YC companies based on evolution, and I think 67 of 100 top YC companies are based in San Francisco. So right above us, there’s an AI company called Scale. Across the street is Airbnb. Two blocks down is Pinterest. You have Zendesk on market too. Essentially, within just one square mile, you probably plenty. Uber, probably $200 billion in terms of valuation of startups, is just in the one square mile. So it’s a pretty exciting place to base your company. We actually have a team of 80 right now, and about 25 or 30 of them are in San Francisco. Then we actually have a lot of employees and full-time contractors that we treat as employees all around the world. We’ve got two in Finland, and we have one in France. A few in the UK, Poland, Germany, and Berlin, Uruguay, Canada. So we’re actually pretty globally distributed, but all the go-to-market team, the product managers and some of the key leaders, are based in San Francisco. Jeroen: So the remote workers are mostly developers? Bryant: Developers and customer support, which is a big contingent of that. Jeroen: Yeah. Did you hire people remotely because it was expensive in San Francisco, or other reasons? Bryant: I was just looking at a link on Hacker News the other day where it showed the arbitrage compensation across all the big tech companies. And it’s pretty crazy. It’s stock and base comp, some engineers are pushing $400,000-450,000 a year in total compensation. So definitely from a hiring perspective, we look at remote as an advantage, given that we’re semi-bootstrapped at this point. But we’re also looking at remote from a diversity aspect as well. I love having our QA people in Europe talk about how eastern European countries are hesitant to use Webflow because of the price, and because we bill in USD. So then we started looking at localized pricing and trying to see what we can do to improve adoption around the world. I think there’s a lot of benefits to not having everyone in the Silicon Valley bubble, and be reminded that the world is really big. There’s a lot of people of a lot of different, varying viewpoints. And creating a company and a culture that is diverse is something that’s really important to us. Jeroen: Yeah, definitely. Slowly wrapping up, what’s the latest good book you’ve read, and why did you choose to read it? Bryant: Oh, man. So I’m not going to choose a business book, because I feel like everyone chooses a business book. I actually read a book about a man-eating tiger in Siberia. And the book is just called The Tiger: A True Story of Vengeance and Survival. It’s by this author, his name’s John Vaillant. And it talks about Amur, a Siberian tiger that essentially tracks down a hunter and hunts him. So it’s essentially a story that unravels a lot. It’s 50% nature conservation and it’s 50% story of this tiger that tracks down this hunter. And given that it’s set in Siberia, it’s a part of the world that I had no history about, and I thought it was a really good book that was the right mix of nature and conservation, as well as a really good plot. So if you’re looking for some, maybe not light reading, but not a typical business book, I definitely recommend checking it out. Jeroen: Yeah, it sounds exciting and different. Is that just the title? Bryant: Yeah, the title’s literally called The Tiger. So it’s a solid book. Jeroen: Yeah. Is there anything you wish you’d have known when you started out? Bryant: Yes. So I would advise myself five years ago, given that we were a very technical team and very product-focused, start surrounding yourselves with the go-to-market expertise in the very early stages of your product development. It would be super crucial. Go to market means a lot of different things to a lot of different people. But to us, it’s finding your ideal customer persona, talking about why that person is the best person to solve for, and then figuring out how to cater your product and technology to solve for it that way. I think that would’ve given us probably 18 months of faster product-market fit, and a lot of early technical teams don’t really focus on that too much. They kind of resort to relying on a sales team or a sales hire to help develop that. And I think that’s ultimately something that founders should embody. Founders should create something not just because it’s cool or it’s good technology or because they think it exists, but founders really need to think about who’s going to buy it and why they should buy it. That’s something that I wish I had definitely known early on. Jeroen: Yeah, so last question. What’s the best piece of advice you ever got? Bryant: Oh man. I’m terrible at this kind of question. I wouldn’t say this is regret, but at least one of the mental frameworks that have helped me a lot was Bezos’s Regret Minimization Framework. As a founder, you’re making decisions all the time. And I think the Regret Minimization Framework is something that I use pretty often when I’m trying to understand the impact of a certain decision. I think the Stripe COO was on the SaaSter podcast, and she talked about decisions that you couldn’t walk back from. And those were the ones that you really had to focus on and spend a lot of time on. So I think that is a really interesting insight because when you’re running a company, there’s a lot of different things that you could walk back from, and in those instances, you should just move uncomfortably fast and bias towards action. But trying to understand which decisions are actually really, really important, because you can’t easily back away from it, those are the ones that you have to really keep an eye on, and those are the ones that you may regret. So that’s not necessarily advice, but at least a mental model that I’ve found useful in my day-to-day. Jeroen: Yeah, that’s a very sound advice. Thank you again, Bryant, for being on Founder Coffee. I’ll also send you over a little package of actual Founder Coffee in the next few weeks. So you can try it at home. Bryant: Awesome, appreciate it. Thanks so much.